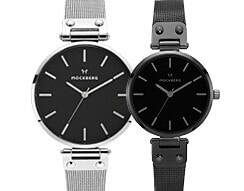 Introducing Swedish watch brand, Mockberg that combines traditional Swedish jewellery design with today's modern Scandinavian minimalism and functionality. Handcrafted with exclusive materials and high quality movements, discover a watch that floats freely on your wrist while giving a three-dimensional impression. It's the details that matter. ​The Swedish watch brand Mockberg finds its inspiration in the traditions of Swedish craftsmanship. The name itself comes from Mockberget, a small mountain near Lake Siljan in Dalarna, middle of Sweden. Dalarna, which means “the valleys” in Swedish, has long been the home of Sweden’s jewelry makers. Mockberg was founded with the vision to design accessories that combined traditional Swedish jewelry design, with todays modern Scandinavian minimalism and functionality.